These Japanese Americans in the newly opened Manzanar Relocation Center had gathered to watch the arrival of fellow internees. Manzanar was the incarceration site located nearest to Los Angeles. It was surrounded by barbed wire, with manned guard towers and searchlights. Ten thousand people were crowded into 504 barracks; eight to ten people were assigned to each room. Internees worked to grow and prepare food and maintain the site. About two thirds of the internees at Manzanar were under the age of 18. Source | Source: War Relocation Authority Photo 210-GID-B3, from Edwar H. Spicer, Asael T. Hansen, Katherine Luomala, and Marvin R. Opler, Impounded People (Tucson: University of Arizona Press, 1969). 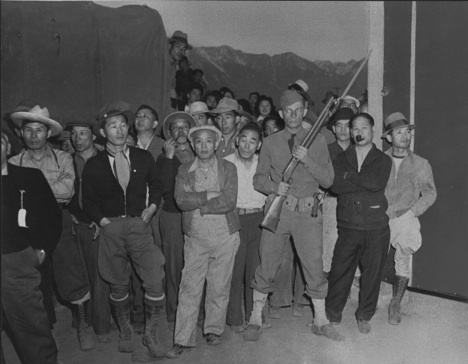 Cite This document | War Relocation Authority, “Incarcerated Japanese and Guard "Greet" New Arrivals at Manzanar,” HERB: Resources for Teachers, accessed April 18, 2019, https://herb.ashp.cuny.edu/items/show/1520.